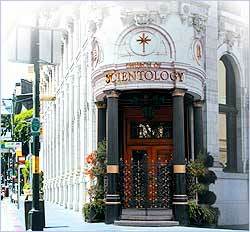 The first time I entered the Church of Scientology’s grand structure in San Francisco, was with suitable equanimity, armed with a great deal of research on what I could expect. My friend, who admittedly enjoyed trolling culties, decided to come along as much to satiate his curiosity as to stir the hornet’s nest. We were greeted at the entrance by an older graying woman, whose face creased unnaturally upwards in a smile meant to encourage the trepid who lingered on the Church of Scientology’s threshold. ‘Hello.’ As a former pro, I can always spot a fake. I mirrored her beam back, hoping to repel it. No such luck. ‘How can I help you folks today?’ She asked without skipping a beat. My friend stepped forward. ‘Well, we just saw your church in passing and thought we’d see what its all about. We’ve heard a lot things about Scientology and thought we’d check it out for ourselves. ‘Well, of course some people say Scientology is a cult.’ My friend went straight for the reactive jugular. ‘Then why are you called ‘Church of Scientology?’ I asked. ‘Why don’t you come over here.’ She avoided responding directly. ‘Let me show you what it’s all about. Our founder L. Ron Hubbard discovered a way to measure psychological problems like depression using a science called dianetics.’ She passed a hand over a shelf of shiny volumes with Dianetics blazoned on their spines in bold letters. ‘If you have a minute, we’d be happy to give you a little preview of how dianetics can help you. If you’d like to follow me…’ we were escorted down a red carpeted hall towards a row of what looked like electric shock machines with silver joy sticks jutting out. ‘This is called an e-meter. Oh hey there Bob!’ She waved over a frumpy overweight guy who mysteriously appeared from behind a white marble pillar wearing a photocopy of her smile. ‘Bob’s gonna answer all your questions.’ She assured us and in this way we were promptly offloaded, freeing smiley lady to return to her greeting station and jump the next passerby. ‘Definitely.’ I said. I’d heard about these machines, sensitive to the slightest quiver of hand. ‘What you wanna do is hold these two silver bars in each hand.’ Bob said and I obediently grasped the joysticks. ‘Sure.’ This was the part I’d been looking forward to. Me and the little red E-meter needle, intended to measure the severity of my negative emotions, stood poised for Bob to begin. Bob took me through a series of questions meant to probe my childhood for negative experiences. ‘Have you ever had a pet that died?’ He finally asked. ‘Nope. Just a sister.’ The needle didn’t move. ‘How did you feel about that?’ Bob wanted to know. ‘Well, how do most people feel when a member of their family dies?’ I was giving him way more info than he could have hoped for. I wanted to make a point, because much to his bewilderment, the needle still hadn’t budged. Bob decided that he’d better increase the needle sensitivity, so he turned the silver knob right up to its highest sensitivity point to ensure it caught any stray emotion lurking in my subconscious. ‘I felt sad. I thought I could have done something to save her, so naturally there was some guilt too.’ Was my brief self-analysis, the duration of which the needle stayed dead centre. Bob couldn’t figure it out. ‘Shouldn’t the needle be moving?’ I commented helpfully. Well, nobody could have found a true answer to their problems outside of the Scientologist solution, so Bob was sure I couldn’t be entirely well. Oh, and the needle held steady. ‘Well, I’m sure you still feel some pain when you think about her death.’ He tried again. ‘No, I honestly don’t and the needle appears to agree with me. I guess I must be a “clear”, huh?’ I joked using their term for a person without negativity. Actually, what they won’t tell you is that the basic problem with people is we’re all infested by dead space aliens. A clear is someone who has managed to eradicate all that negative alien energy. That anyone walking in off the street, having never gone through the Scientology course, could be a clear was an impossibility to Bob. My friend was quick to jump in. ‘Wow, guess you don’t need Scientology to become one.’ His voice was loud enough to attract the notice of several visitors to the building. ‘No, no, no!’ Bob was starting panic. ‘You’re not a clear! The machine is just broken.’ This was the first time he unconsciously dropped the smile. Another woman appeared almost on cue. I was starting to find the whole materializing out of the ether thing they all did creepy. They must be watching everything and everyone with hidden cameras. A lengthy argument ensued between my friend, Bob, Dorris and me which ended with us being shown the door and encouraged to make swift use of it. We left feeling smugly successful on one count. None of the Scientologists were smiling any more. By the clear display of negative feeling towards us, I had to surmise that they weren’t clears either. So it’s settled, you are officially the funniest entrant in the Global Bicycle Race.